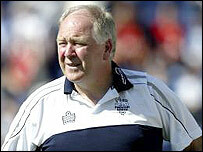 Preston boss Craig Brown has left the club "by mutual consent" after the team's poor start to the season. The former Scotland coach had been in charge at Deepdale since April 2002 but the club finished 15th last season and have won only one game this term. Chairman Derek Shaw, who had a meeting with Brown on Sunday, said: "This is a very difficult decision but we have agreed that it is time for a change." First team coach Billy Davies will take charge against Rotherham on Monday. Brown added: "This time last year we were in a similar position, then went on a run to take us to a play-off position by January. I feel strongly that this is very possible yet again. "I know the team is in the hands of an extremely capable coach and I am sure that Billy is the man to bring success to the club."